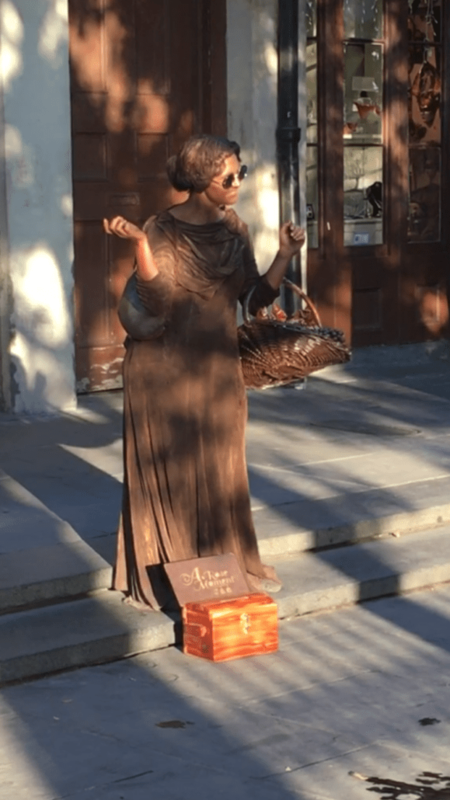 This Living Statue in New Orleans’ French Quarter comes alive when passersby put money in her box. She reaches into her basket and carefully selects an inspirational message, like the one pictured at the top of this post. Musician, artist and author Amanda Palmer wrote the book on asking, and she credits much of her knowhow to the experiences she had as a “living statue” and as a successful crowdfunder. Asking is a core skill required for crowdfunding, yet it does not come easy. Asking makes us feel vulnerable—we worry about what people will think (I’m needy, greedy, inept or just a pest) and we fear the rejection of being told “no.” So how do we get past this? Amanda offers a key insight—the act of asking creates a connection between you and the people you ask—and when they feel connected, they want to help you. I saw this unfold last week when I was in New Orleans for the CDFA National Summit. A bronze maiden stood motionless on the sidewalk as two women stopped in front of her to snap a selfie. Before they could walk away, the statue made her ask by moving her right forefinger slightly up and down, pointing toward the money box at her feet. The women observed, felt the connection, and happily stuffed some cash into her box. Amanda Palmer’s TED talk describes how her connections with her fans made her campaign the biggest music crowdfunding campaign at the time. The Transformative Power of Gratitude Lighting the crowdfunding fire!